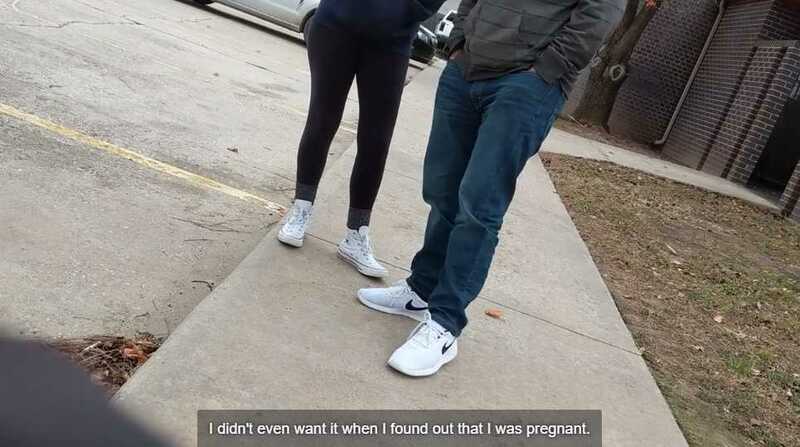 A viral video posted to social media on Friday shows a man and woman who professed to be Christians declining a woman’s pleas not to abort their baby, stating that the child would interfere with their plans and that they had “prayed about” the matter. While the background behind the video, such as the location of the recording, has not been divulged, the footage captures the nearly seven-minute conversation between the young couple and a woman named Kate. “You guys aren’t here for an abortion, are you?” called out Kate, who stood on the sidewalk to help abortion-minded women turn from murder. Kate warned the young woman that she was about to do something she could never undo. “Just because your son or daughter is really, really small and you can’t see him, and he’s really weak and defenseless right now, doesn’t make it less terrible to murder him than if he were older, or you could see him. He doesn’t change from a non-baby to a baby as he’s born,” she explained. The father of the child then chimed into the discussion. “So, you guys are Christians? You’re followers of Jesus Christ?” Kate asked. Kate explained that there was no circumstance that warranted killing their son or daughter. “You’re going to have to stand before God and give an account for yourself, and He’s going to say, ‘I sent someone to warn you and you killed your son or daughter anyway.’ Please don’t do this,” she pleaded. “I know that this seems inconvenient, that you have a lot of plans, but I promise you doing the right thing and being faithful to God and being a good mother and father is better, and will result in a good life for you [better] than whatever you have planned that you feel you have to get rid of this child for,” Kate added. She reiterated that killing a baby in the womb is no different than murdering them outside of the womb because they are inconvenient. “I understand, but unfortunately, we’ve made our decision,” the father stated. As Kate continued to plead with the man to take care of both mother and child, he repeated that the two had already made up their minds. “I get it. And I have my thought process and I’m not saying it’s right, but it’s kind of what I’m doing,” he said. “So why would you do something you know is wrong?” Kate asked. “Because I’m a human and I make mistakes,” the father answered. Kate then warned the couple that they were not simply making a mistake, but intentionally doing what they know is wrong. “I understand,” the father replied. He advised that the two would think about it and consider their options. Kate said she was not sure that was so, and that it seemed that the two had their heart set on abortion. “I’m trying to persuade you not to even go into this place,” she explained. “It’s not just a bad mistake. It’s murder,” Kate noted. “I understand,” the woman replied. Kate again warned that the couple will have to give an account before God for killing their son or daughter. “Then I can take that sin,” the woman asserted. “No, you can’t, ma’am,” Kate answered. “I don’t care,” the woman bluntly admitted. “Why don’t you care?” Kate asked. “You guys say you’re followers of Jesus Christ, but you don’t care about innocent children? He then asserted that all sin is equal. “Ma’am, I will take your child if you don’t want it,” Kate pleaded as the two began to walk away. “I don’t want to go through the process,” the woman called out. Kate continued to urge the couple to love their son or daughter as his or her parents, but the two continued on their way and proceeded to enter the abortion facility. It is not known what happened after that point. The video had received over 135,000 views as of press time.